Trunks: Erect, often forming clumps; roots shallow, spreading. Leaves: Opposite, simple, slender stalked, broadly ovate to lanceolate, 2.5 to 4.5 inches long, 1 to 3.5 inches wide, firm, rough above, whitish-woolly below; margins entire; tips tapering to points. Flowers: In open, nearly flat-topped cymes, 1.5 to 3 inches across, terminal on new branches. Flowers white to cream colored, densely appressed-hairy; sepals 4, whitish; petals 4, oblong-lanceolate, spreading or rolling backward; stamens 4, filaments white, anthers yellow; style 1, cream to pale green. Fruit: Nearly spherical, about 1/5 inch in diameter, white, 1-seeded, in upright clusters; ripen late summer to early fall. Habitat: Rocky hillsides, woodland edges, thickets, and stream banks. 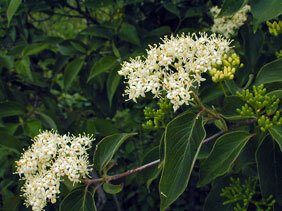 Uses: Rough-leaf dogwood provides cover for wildlife and the fruits are eaten by many species of birds. Comments: The scientific name honors Thomas Drummond, a Scottish botanist who lived from 1780-1835. Rough-leaf dogwood does well in drought conditions.